Dance under the stars at the Blue Dragon – The Big Island’s Hidden Treasure! Looking for night life on the Kohala Coast? The Blue Dragon is THE place to be. Fine music, ono food, and a casual, friendly atmosphere make this the place to be any Thursday, Friday, Saturday or Sunday evening. You can subscribe to their calendar for updates on scheduled performers, and once in a while they schedule a bigger name like John Cruz, or John Keawe. For such special shows, at reasonable cover charges, like $20/each, those shows sell out quickly, so keeping abreast of the schedule is a must if you want to participate. Besides the food and music, the ambiance at the Blue Dragon is an experience to take home with you. Tall walls and unique lighting hide the fact that the place has no roof! Dancing in an enclosed space, while under the stars at the same time is an experience to be cherished and repeated every time you visit the Big Island. A popular local venue, The Blue Dragon offers amazing body work, as well! During the day, you can schedule your spa treatment, therapeutic massage, or other soul-satisfying experience, and return again for the evening delights. Their body workers are all professionally trained, have years of experience, and areregarded as some of the best on the island, and their body products are good enough to eat — made from all organic ingredients and as locally made as possible. Whether it is your first massage or a part of your weekly self care routine, all treatments are customized to meet your individual needs. Feed the Soul, Body and Mind at Blue Dragon Bodywork. Here is a line-up of the body work options for your nurturance. Our luxurious and pampering signature medley of your choice of a body scrub, mini-facial, and a massage — a must have! Trance out with a deeply balancing and relaxing series of light and gentle holds on the bones of the skull and spine. Four hands massage for the ultimate in relaxation! Traditional Hawaiian massage using long, firm, rhythmic strokes to deeply nourish the body, mind, and soul. Our version of the very best pampering of the feet. Includes a foot scrub, foot massage, and a bit of hand and neck massage for a satisfying completion! A targeted, tailored treatment using massage techniques and hot & cold therapy as needed to provide relief to problem areas. Traditional European technique using gentle kneading and smooth strokes to relieve stress and tension. Delight in the best pampering for the face, neck and scalp! We are proud to now offer treatments with Dr. Kennedy, the only “Proficiency Rated practitioner of Activator Method Chiropractic Techniques” on the Big Island. 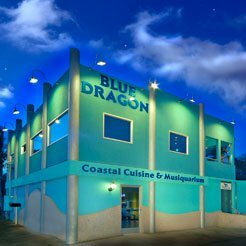 So, feed your mind, body and soul at the Blue Dragon, and take home memories to share for a lifetime. This entry was posted in Big Island Activities, Big Island Night Life and tagged Big Island Night life, dancing, dining, entertainment, music, ono food. Bookmark the permalink.